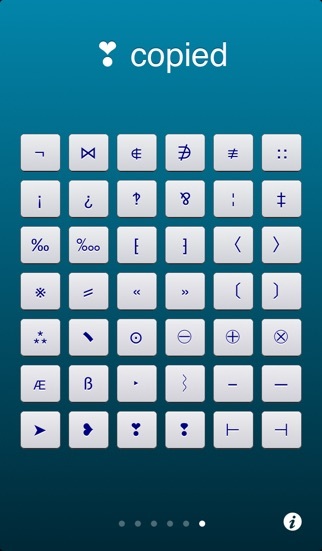 Character Pad gives you quick access to 250 beautiful and useful special characters, which you can use in any application. 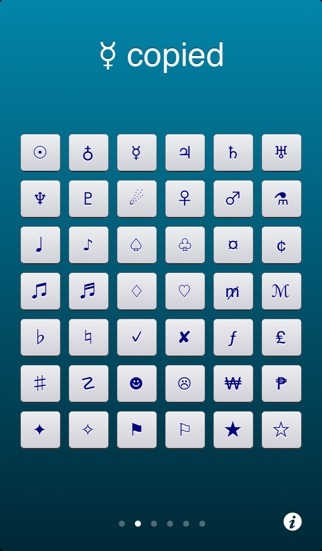 Easily customise your IMs, emails, documents and other texts with a great selection of special characters & symbols. Simply tap a character to copy it to your iDevice's clipboard, open any other app, and paste it anywhere you like. Done. Easy! 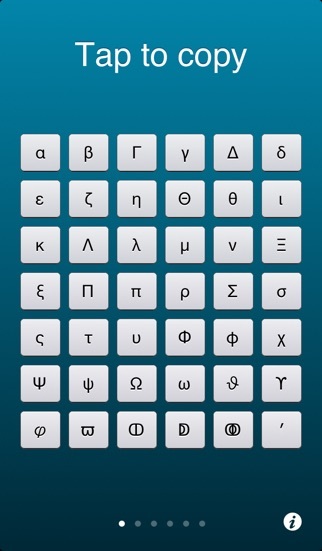 Characters include: - Greek alphabet - Math symbols - Letterlike symbols - Many more! What two App Store reviewers had to say about Character Pad: "Dead easy to use and works a treat! Update with more characters some time........" 5 Stars - Soxcat "Fast, simple, does one thing and does it seemlessly. No more having to write ½ as 1/2. Thank you, well worth the dollar!" 5 Stars - Auntmarge64 ▶ If you're looking for a more complete special character writing experience, please check out CHARACTER WRITER, our new text editor for iPad. Please Note: Characters will be readable from any iPad, iPhone, iPod Touch, Mac and most PCs. Also some special characters may appear as question marks (?) or squares for some recipients of text messages whom use non-iPhone mobiles. 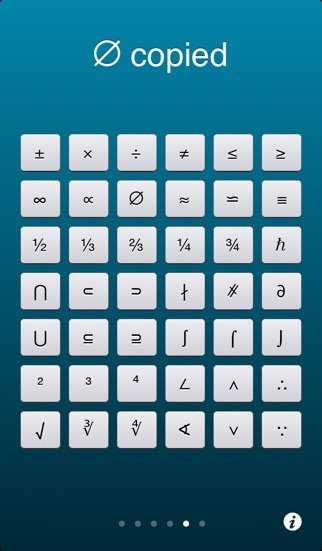 This is a very nice App for engineers. Sometimes I can't find the character I need until later, good example I needed mu 'μ' symbol and I couldn't find it when I needed it. It would be nice to have a favorites or recently used panel with the last 10 characters use like Word does. Simple to use but some key characters missing. This is a very simple app. Tap one character to place it in the paste buffer. Of course it does offer another app the extends the regular keyboard for a price. There are always characters you would like to see and even a few duplicates of my regular keyboard. For example the £ symbol although it does want you regular keys for €. I ways happy to find the degree by itself along with F and C. What I would have liked was a raised 1 to accompany the 2, 3, 4 so that the could be used for footnotes as well and lowered 2,3,4 for chemistry use. I have no need to try and squeeze mm squared into one character. I would also like to grab more than one character at a time. But all in all it is useful. Easy access to the characters needed for technical writing. Version 1.3 was the Best! I was upset with the new update of the "non-classic" version all of a sudden locking features I had before it. This app is awesome as it brings back the old characters and UI. :) 10/5 stars! This app is an elegant way to solve a problem until someone comes up with a built in feature. 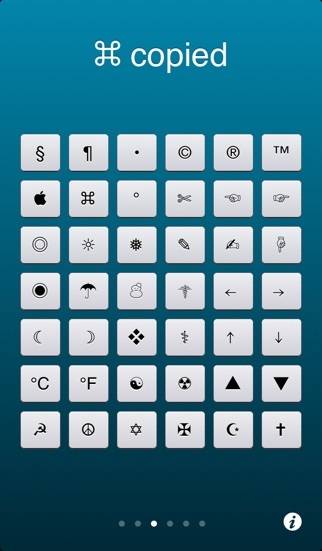 Maybe in IOS 8 with 3rd party keyboard extension. ☠ I love the variety of symbols! I tried to use this to insert a micro symbol. It added all sorts of other things and messed up other micros. Deleted! !